The Strategic Defense Initiative (SDI), also known as Star Wars, was a program first initiated on March 23, 1983 under President Ronald Reagan. The intent of this program was to develop a sophisticated anti-ballistic missile system in order to prevent missile attacks from other countries, specifically the Soviet Union. With the tension of the Cold War looming overhead, the Strategic Defense Initiative was the United States’ response to possible nuclear attacks from afar. Although the program seemed to have no negative consequences, there were concerns brought up about the program “contravening” the anti-ballistic missile (ABM) of the Strategic Arms Limitation Talks years before. For this reason, in conjunction with budgetary constraints, the Strategic Defense Initiative was ultimately set aside. The Strategic Defense Initiative was eventually abandoned, and after a few years, it was nothing other than a short chapter in history books. With bold intentions, the Star Wars program was hopeful of a revolutionary defense system, a system which was said to be nearly impenetrable. Yet with political pressure, both domestic and international, combined with budgetary conflicts, the Strategic Defense Initiative was slated for failure from the start. Fear of Soviet retaliation due to violations in the ABM treaty from the first S.A.L.T. talks was a primary factor in these international pressures, but United States legislators and congressmen also argued that a creation of a large anti-ballistic missile system would raise tensions between the two nations and potentially spark a conflict. Because having a pre-emptive strike in a nuclear war would be advantageous, both nations were already on edge and so it was decided that any project which could jeopardize the balance would be discarded. The treaties set up by the S.A.L.T. talks remained in effect for nearly 30 years and it was not until 2001 when President George W. Bush cited Article 15 of the ABM treaty and pulled America out. By this point, the SDI was far behind and relations with Russia, no longer the Soviet Union, were vastly improved. The principal foreign policy framework for the Ronald Reagan administration rejected acquiescence in the Cold War status quo that had emerged during the Nixon, Ford, and Carter presidencies. Reagan objected to the implied moral equivalency of détente, insisting instead on the superiority of representative government, free-market capitalism, and freedom of conscience over what he viewed as godless, collectivist, Communism. This more confrontational approach eventually came to be labeled the “Reagan Doctrine,” which advocated opposition to Communist-supported regimes wherever they existed, as well as a willingness to directly challenge the Soviet Union on a variety of fronts. Often referred to as “the great communicator,” Reagan utilized his rhetorical skills to frame the Cold War contest as a fundamental clash between good and evil. In his first inaugural address on January 20, 1981, the new President contrasted the “enemies of freedom” as doomed to fail when faced with the “will and moral courage of free men and women.” Later that year in an address at Notre Dame University he stated that “the West won’t contain Communism, it will transcend Communism.” In 1983, he famously characterized the Soviet Union as an “evil empire.” In 1987, standing in front of the Berlin Wall constructed by the East German communist regime a quarter-century earlier to stem the flow of East Germans to the West, Reagan challenged the patron of the East German regime, Soviet leader Mikhail Gorbachev, to “tear down this wall.” Reagan’s many memorable public addresses served as an important tool to galvanize support for policies that often sparked considerable controversy. The Reagan administration advocated a wide array of initiatives that heightened confrontation with the U.S.S.R. and its allies. Reagan engineered a significant increase in U.S. defense spending designed to modernize existing forces and achieve technological advances the Soviet Union could not match. For example, the administration advocated building a much larger navy with enhanced technical capabilities, deployment of intermediate-range nuclear missiles in Europe, development of terrain-hugging cruise missiles difficult both to detect and to shoot down, and the Strategic Defense Initiative, which held out the prospect of seizing the ultimate “high ground”—outer space—by preventing intercontinental nuclear missile warheads from reaching their targets. During his two terms in office, Reagan successfully advocated increasing the Defense Department budget by 35%. The United States supported Afghan resistance organizations opposing the Soviet-backed regime in Kabul, anti-communist forces in Angola, and the Contras in Nicaragua. In 1983 American forces invaded Grenada to forestall installation of a Marxist regime. The administration also greatly increased spending on the U.S. Information Agency, especially Voice of America and Radio Free Europe/Radio Liberty, signaling the importance placed on challenging Soviet ideology throughout the world. Conversely, heightened tensions also led Reagan administration officials to attempt conciliatory measures designed to reduce the threat of direct confrontation, especially nuclear war. In 1982, Reagan broached the idea of substantially decreasing nuclear weapon stockpiles, which eventually resulted in the landmark Strategic Arms Reduction Treaty (START). The emergence of Mikhail Gorbachev as the principal Soviet leader provided Reagan with a partner willing to engage in substantive negotiations. A series of summit meetings ensued which reduced tensions and produced concrete results, such as the 1987 Intermediate-Range Nuclear Forces Treaty (INF) that eliminated the deployment of theater-level nuclear missiles in Europe. The Reagan administration dealt with many other foreign policy issues as well. Affairs in and around Southwest Asia continued to present multiple challenges, including a Lebanese civil war, strained relations with Iran, and increasing tensions after the bombing of Libya in retaliation for a state-sanctioned terrorist attack in Berlin. A (third) joint communiqué with the Peoples’ Republic of China reiterated both parties’ commitment to improved relations, while not resolving all issues related to Taiwan. Trade disputes with Japan required constant attention. The United States had to determine what course to steer amid hostilities between allies during the Falklands Crisis. A variety of global issues also rose to prominence. After a decade of negotiation, the administration opted not to support Senate ratification of a comprehensive Law of the Sea treaty out of concerns about the potential for the internationalizing of seabed mining operations and potential impingement on U.S. Navy prerogatives. The United States increasingly promoted its enforcement preferences regarding drug trafficking, resulting in a landmark 1988 treaty. It became apparent that the AIDS crisis represented an international public health issue of consequence. With the increasing rapidity of international communications, enhanced global trade, and the rising world-wide movement of people, many issues previously considered “domestic” became subject to diplomatic negotiation. The Secretary of State occupied a prominent position in Reagan’s approach to creating and implementing foreign policy. Alexander Haig first occupied the chair, but an inability to exert as much influence as he desired caused him to resign after only 18 months in office. George Shultz served as Secretary for the remainder of Reagan’s two terms, and is generally regarded as an effective bureaucratic manager and influential policy leader. Caspar Weinberger served as Secretary of Defense for almost seven years and William Casey as Director of Central Intelligence for six years. Both played key roles in the foreign policy arena. The position of National Security Adviser was downgraded somewhat during the Reagan administration. The six individuals who occupied the position exercised relatively less influence than predecessors in the Carter, Ford, or Nixon White House. Perhaps to an unusual degree, the accomplishments of this administration are viewed in the light of events that occurred after Ronald Reagan left office in January 1989. Within a year, the Berlin Wall fell, and by the end of 1991 the Soviet Union had collapsed, signaling the end of the Cold War. Historians and other analysts continue to debate the extent of their influence, but there is no question that Ronald Reagan and his foreign policy advisers played key roles in this remarkable turn of events. In 1979, the Soviet Union invaded Afghanistan to try to prop up the communist government there, which was being attacked by Muslim Mujaheddin fighters. This immediately caused a rift with America, which boycotted the 1980 Olympics. 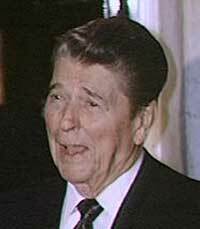 In 1980, Ronald Reagan became president of the USA. As a strong anti-communist, he called the Soviet Union the “evil empire” and increased spending on arms. The US military developed the neutron bomb, cruise missiles and a Star Wars defence system using space satellites. By 1985, the Soviet Union was in trouble. In 1985,Mikhail Gorbachev became leader of the USSR.